APD operates as a Master Distributor only for products that are unique, far ahead of any competition and are proven to be safe and effective over time. There are so many products on the market for which outlandish claims are made. Either the products don't perform as claimed or they have harmful side effects. APD's products are heavily documented for their safety and effectiveness by respected organizations and companies. Much of the documentation is available here on the website. Other documentation is available on request. APD is at 10410 Kensington Parkway, Suite 211, Kensington, Maryland 20895. Telephone 1-800-421-1048 and (301) 933-7737. Fax: (301) 933-7738. e-mail is alanroth@apdinc.com To read more about us: Click Here! We provide a money-back guarantee on all purchases by U.S. retail customers!! New technology for increasing octane and horsepower, reducing emissions and improving gas mileage. It is very cost-effective to use and is heavily documented. 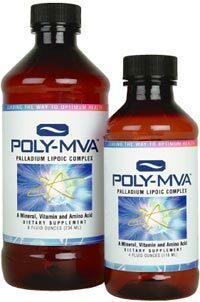 Poly-MVA is a unique complex structure using Palladium and Alpha Lipoic Acid as its core. It acts in the body unlike any other ingestible product. The benefits of using it are fabulous. You can check it out by clicking here. This powerful supplement is extremely important for people undergoing treatment for cancer. It strengthens the immune system to combat the dangerous effects of radiation and chemotherapy. It is the focus of a new field in medicine called Electrogenetics. The website has a large number of technical documents. Safely outcleans all other vinyl and leather cleaners, and provides years of protection that is long-lasting and non-slippery. There is no product like it on the market. Advanced Product Distributors is proud to represent a number of Japanese chemical companies and a Chinese chemical company that manufacture additives for PVC. These additives make PVC more stable and much safer in our fragile environment. Copyright © 1996 Advanced Product Distributors, Inc. All rights reserved.